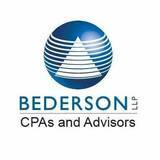 Since 1937, Bederson LLP has been providing accounting, auditing, tax, valuations and business advisory services to individuals, middle market businesses and nonprofit organizations. With offices in West Orange and Fairfield, New Jersey, Bederson’s client base includes industries such as professional services, nonprofit entities, schools, distribution and many more. The firm assists clients with trust and estate services as well as complex domestic and international tax issues. Bederson also provides insolvency and litigation services to the legal community. For Four consecutive years, the firm was named to the New Jersey Law Journal’s “Best Of” list by readers the Law Journal. In 2014 the firm received top honors in all 6 accounting categories and in 2015 Bederson was voted “Best of” in 7 categories. The firm also received FBI recognition for work on one of the largest fraud/bankruptcy cases in New Jersey history.